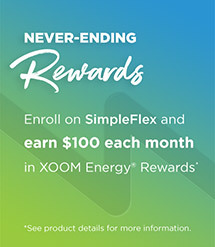 This Promotional Offer is available to new residential customers only. 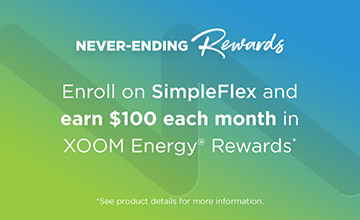 XOOM Energy may end this promotion at any time without notice.This rate may change in the subsequent months at the sole discretion of XOOM Energy. This price includes transmission charges and estimated total state taxes, including the Gross Receipts Tax, but excludes applicable state and local sales taxes. 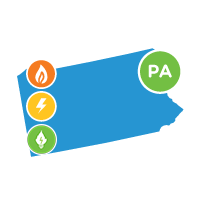 You will continue to be responsible for all charges assessed by your local utility for all services it provides, including other fees and/or taxes. Only the utility account holder or persons legally authorized on the account may enroll. If you are currently under a contract with a retail supplier, understand your obligations and rights before switching. 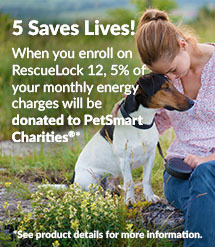 Get the peace of mind you deserve with our SureLock 36 fixed rate plan! Three year agreement required. Other taxes and fees may apply. If you cancel your service before the contract ends, a cost recovery fee of $300 may apply. Only the utility account holder or persons legally authorized on the account may enroll. If you are currently under a contract with a retail supplier, understand your obligations and rights before switching.